The North Dakota State Library has awarded the Fargo Public Library the 2018 North Dakota Star Library Award for going above and beyond with the service the Fargo Public Library provides to its community. The Fargo Public Library was compared to other libraries in North Dakota with similar operating expenditures. It ranked in the top three libraries of its category. The awards were based on circulation, central branch service hours, program attendance, combined computer and WiFi usage and the percentage of North Dakota Library Coordinating Council Standards for Public Libraries met. 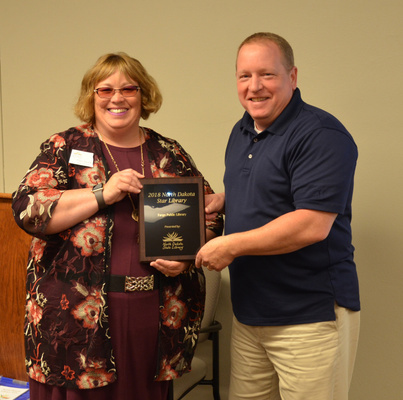 Librarian Tim Dirks was presented with the Star Library Award on August 15, 2018, at the Summer Summit, which was hosted by the North Dakota State Library. For more information about the North Dakota Star Library Award, contact BreAnne Meier at the ND State Library at 701.328.4656.